Whipple's disease is a rare multi-organ infectious disease caused by Tropheryma whipplei (T whipplei), and it is generally accepted that both the presence of the bacillus and the host response are responsible for its clinical manifestations (15). The incidence of this disease is rare with cases occurring predominantly in white males (67). The clinical manifestations can be quite variable but gastrointestinal symptoms are usually the first to appear in most patients (8). The disorder has not been reported previously from the English-speaking Caribbean countries. We present a case of Whipple's disease in an Afro-Caribbean patient from Jamaica. A 40-year old man presented with a six-month history of weight loss and diarrhoea. He was known to have mental retardation since birth. He did not attend school and was taken care of by relatives. He was able to carry out activities of daily living, and hold simple conversations. He had no other known illnesses. He was relatively well until six months previously, when he developed diarrhoea and started losing weight. He reported approximately four daily episodes of brown, watery, small volume stools in association with vague generalized abdominal pain and anorexia. He later noticed intermittent abdominal distension and discomfort. There was no history of fever or night sweats. The patient was not on any medication and he denied haematochezia, greasy stools, history of recent travel or ill contacts. He sought medical attention and was given antibiotics which resulted in temporary cessation of the diarrhoea. However, the diarrhoea returned approximately one week after completing the course. A few episodes of nausea and vomiting were noted two weeks prior to presentation. Vomitus consisted of previously eaten food, without blood. His past medical history was significant for longstanding constipation. This resolved spontaneously approximately 20 years ago with the passage of regular brown stool approximately once daily until six months prior to presentation. Examination revealed a young, small built male with mild general muscle wasting. His vital signs were normal. There was no lymphadenopathy or icterus. His abdomen was soft, globally distended and non-tender with no organomegaly. His neurological examination showed lack of orientation to time and place but he was cooperative. His speech was fluent, slow but comprehensible. His memory was impaired. Cranial nerve examination was normal while motor examination revealed decreased muscle bulk but normal power. Sensory examination was normal. Investigations revealed iron deficiency anaemia, normal electrolytes and hypoalbuminaemia. HIV and HTLV-1 tests were negative. Colonoscopy with biopsy was normal. 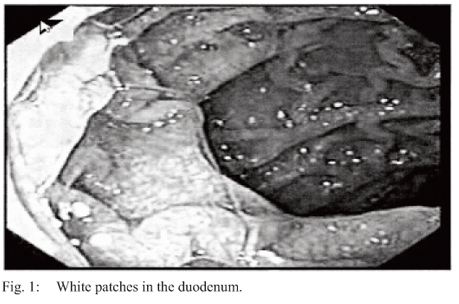 Upper gastrointestinal endoscopy revealed white patchy lesions in the duodenum (Fig.1). On histology, the duodenal biopsy showed broadening and thickening of the villi by a dense infiltrate of foamy histiocytes within the lamina propria and focally extending into the attached submucosa (Fig. 2). 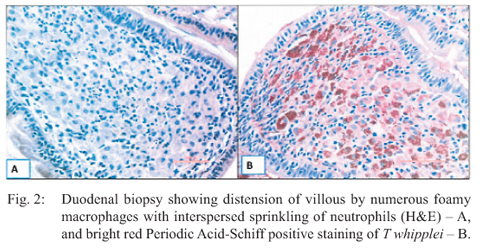 Periodic Acid-Schiff (PAS) stains were positive (Fig. 2) and the diagnosis of Whipple's disease was made. Electron microscopy on the duodenal biopsy was confirmatory and polymerase chain reaction (PCR) testing conclusively identified the organisms as T whipplei (Fig. 3). A computed tomography (CT) scan of the brain and lumbar puncture were both normal. Echocardiogram revealed no cardiac abnormality. Slit lamp examination of the eyes was unremarkable. His evaluation by the psychologist confirmed severe mental retardation. Intravenous antibiotic therapy was commenced with ceftriaxone ( 2 g intravenous twice daily) for two weeks followed by prolonged (one year) co-trimoxazole orally (Bactrim double strength one tablet twice daily). Upon review several months later, his diarrhoea had resolved and he had gained weight. Whipple's disease is a rare systemic infectious disorder, first described by George Whipple in 1907 and first diagnosed in life in 1947 (8). It is caused by the organism Tropheryma whipplei, a gram positive bacillus. The incidence rate of Whipple's disease is extremely low and thus there is no accurate estimate of either the prevalence or mortality rate (6, 9). The occurrence of classicalWhipple's disease inAfricans and persons of African descent and in the English-speaking Caribbean is rare and this is the first reported case from this region. It is suggested that genetic factors may determine the clinical manifestation of T whipplei infection and that classical Whipple's disease is just one possible rare manifestation (10). The diagnosis of Whipple's disease is difficult, with the usual bacterial culture methods failing to grow the organism. Successfully culturing T whipplei with a different approach, using human fibroblast cell line (HEL) has been reported (11). The organism was shown to be slow growing with a very long doubling time. This method has not been accepted for routine use and the diagnosis ofWhipple's disease is made by demonstrating characteristic lesions in tissue obtained from biopsy of affected organs, such as the duodenum and eyes. It is characterized by accumulation of macrophages in the lamina propria with intensely PAS positive intracellular material (12). Upper gastrointestinal endoscopy with biopsies of the small intestine is the diagnostic test of choice (13). Positive PAS-stained macrophages infiltrating body tissues are, however, not pathognomonic forWhipple's disease. These macrophages can also be detected in infections observed in patients who are immunosuppressed with HIV infection. Diagnostic electron microscopy reveals coccobacillary bodies that represent the T whipplei organism, which is diagnostic. Polymerase chain reaction for T whipplei nucleic acid will be positive in the affected tissue(s) (1416). Asymptomatic carriers of T whipplei have been described. Therefore, an isolated positive PCR for T whipplei in gastrointestinal mucosa or contents is not sufficient for a definitive diagnosis of Whipple's disease. Nevertheless, where the clinical picture is suggestive of the disease, PAS positive macrophages on histology of appropriate specimens is classically considered diagnostic and a positive PCR is regarded as confirmatory forWhipple's disease (6). Clinically, Whipple's disease is characterized by two stages: a prodromal stage and a much later steady-state stage. The prodromal stage is characterized by variable findings, mainly arthralgia and arthritis. The steady-state stage is typified by weight loss, diarrhoea, or both. Occasionally, due to involvement of other organs, patients may develop skin and ocular manifestations (uveitis, retinitis, optic neuritis), generalized lymphadenopathy, blood culture-negative endocarditis which may be complicated by cardioembolic strokes, and a sarcoidosis-like syndrome with mediastinal lymph nodes and central nervous system (CNS) involvement. Gastrointestinal complaints typically precede CNS symptoms by several years. In our case, the patient was born with mental retardation, which is not one of the manifestations described in the literature. Despite concerns that this may have been a manifestation of CNS involvement, his gastrointestinal symptoms resolved with treatment while his mental status remained the same, indicating that it was unlikely to be a part of the disease process. Whipple's disease is fatal without treatment. Tetracycline had been the mainstay of therapy for many years, before a comprehensive review demonstrated a relapse rate of 35% among patients treated primarily with this agent (17). The rate of CNS relapse was also high, and re-treatment of CNS relapse with tetracycline was not effective. Subsequent management has consisted of parenteral ceftriaxone followed by oral trimethoprim-sulfamethoxazole (TMP-SMX) maintenance therapy for one year. The rationale for prolonged therapy is to permit complete eradication of the organism, thereby reducing the likelihood of relapse. Treatment with TMP-SMX appears superior to tetracycline in inducing clinical remission (18). In addition, TMP-SMX has been more effective for CNS disease although it is not curative in all cases. The response to treatment can be monitored by following the patient's haematocrit, weight, and symptom resolution. Surveillance endoscopy and small bowel biopsy are not necessary and may be misleading since PAS positive material may persist long after clinical resolution of the disease. It has been suggested, however, that follow-up PCR testing may have greater predictive value (15). T whipplei appears to be widely present in the environment and postulated to be in soil and water. It has been suggested that host factors indicated by immune deficiencies are responsible for the development ofWhipple's disease. Recent data demonstrate a persistent defect of the cellular immune response (19). It is likely that subclinical or transient cases of Whipple's disease and other manifestations of infection with T whipplei will be discovered in the years to come as our knowledge improves regarding the natural history of the disease, given the improvements in diagnostic capabilities. 1. O'Duffy JD, Griffing WL, Li CY, Abdelmalek MF, Persing DH. Whipple's arthritis: direct detection of Tropheryma whipplei in synovial fluid and tissue. Arthritis Rheum 1999; 42: 81217. 2. CelardM, de Gevigney G,Mosnier S, Buttard P, BenitoY, Etienne J et al. Polymerase chain reaction analysis for diagnosis of Tropheryma whipplei infective endocarditis in two patients with no previous evidence of Whipple's disease. Clin Infect Dis 1999; 29: 134849. 3. Gubler JG, Kuster M, Dutly F, Bannwart F, Krause M, Vogelin HP et al. Whipple endocarditis without overt gastrointestinal disease: report of four cases. Ann Intern Med 1999; 131: 11216. 4. GerardA, Sarrot-Reynauld F, Liozon E, Cathebras P, Besson G, Robin C et al. Neurologic presentation ofWhipple disease: report of 12 cases and review of the literature. Medicine 2002; 81: 44357. 5. Kelly CA, EganM, Rawlinson J. Whipple's disease presenting with lung involvement. Thorax 1996; 51: 34344. 6. Fenollar F, Puéchal X, Raoult D. Whipple's disease. N Engl JMed 2007; 356: 556. 7. Fenollar F, Raoult D. Whipple's disease. Curr Gastroenterol Rep 2003; 5: 37985. 8. Whipple GH. Ahitherto undescribed disease characterized anatomically by deposits of fat and fatty acids in the intestinal and mesenteric lymphatic tissues. Bull Johns Hopkins Hosp 1907; 18: 38293. 9. Conly JM, Johnston B. Rare but not so rare: the evolving spectrum of Whipple's disease. Can J Infect Dis 2001; 12: 1335. 10. Fenollar F, Trape JF, Bassene H, Sokhna C, Raoult D. Tropheryma whipplei in faecal samples from children, Senegal. Emerg Infect Dis 2009; 15: 9224. 11. Raoult D, Birg ML, La Scola B, Fournier PE, Enea M, Lepidi H et al. Cultivation of the bacillus ofWhipple's disease. N Engl JMed 2000; 342: 6205. 12. Black-Schaffer B. The tinctoral demonstration of a glycoprotein inWhipple's disease. Proc Soc Exp Biol Med 1949; 72: 225. 13. Durand DV, Lecomte C, Cathebras P, Rousset H, Godeau P. Whipple disease. Clinical review of 52 cases. The SNFMI Research Group on Whipple Disease. Medicine 1997; 76: 17084. 14. Patel SJ, Huard RC, Keller C, Foca M. Possible case of CNS Whipple's disease in an adolescent with AIDS. J Int Assoc Physicians AIDS Care 2008; 7: 6973. 15. Ramzan NN, Loftus E Jr, Burgart LJ, Rooney M, Batts KP, Wiesner RH et al. Diagnosis and monitoring ofWhipple disease by polymerase chain reaction. Ann Intern Med 1997; 126: 5207. 16. Marth T, Schneider T. Whipple disease. Curr Opin Gastroenterol 2008; 24: 1418. 17. Keinath RD,Merrell DE, Vlietstra R, DobbinsWO. Antibiotic treatment and relapse in Whipple's disease. Long-term follow-up of 88 patients. Gastroenterol 1985; 88: 186773. 18. Feurle GE, Marth T. An evaluation of antimicrobial treatment forWhipple's disease. Tetracycline versus trimethoprim-sulfamethoxazole. Dig Dis Sci 1994; 39: 16428. 19. Moos V, Kunkel D,Marth T, Feurle GE, LaScola B, Ignatius R et al. Reduced peripheral and mucosal Tropheryma whipplei-specific Th1 response in patients with Whipple's disease. J Immunol 2006; 177: 201522.